Vientiane (VNA) – Vietnam’s State Auditor General Ho Duc Phoc and President of the Audit Office Organisation of Laos Viengthong Siphandone agreed to continue boosting ties between the two audit agencies during their talks in Vientiane on April 4. 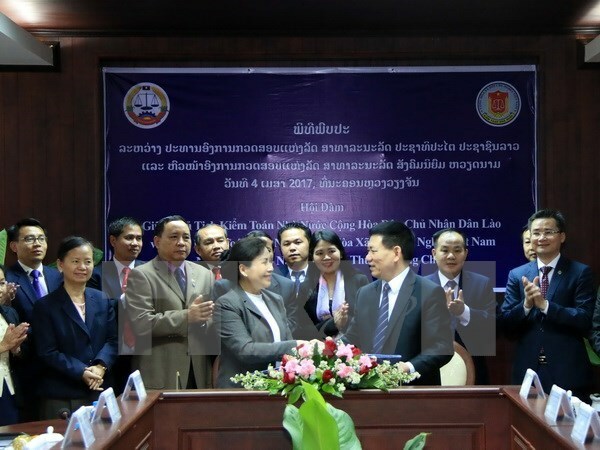 They spoke highly of the outcomes of the 2016 cooperation plan, with the Lao side sending two delegations to Vietnam to learn about auditing new rural development programmes and public debts, audit management mechanisms, the process of making amendments and supplements to the Law on State Audit, audit standards and international cooperation. The State Audit Office of Vietnam (SAV) also sent a delegation to Laos to train their counterparts in auditing banks and the securities market, State budgets and treasuries from the central to local level. In the near future, both sides will facilitate the exchange of experts and technical transfer to the Audit Office Organisation of Laos via training in each country in the audit of basic construction, projects funded by official development assistance and other fields of shared concern. Host and guest vowed to utilise activities within the framework of the 2017 and 2016-2020 cooperation agreements between the two governments, continue reviewing the outcomes of the 2000 collaboration deal and push forward the 2016-2018 cooperation plan. The two State audit offices will work closely together at multilateral forums, especially those within the framework of the ASEAN Supreme Audit Institutions (ASEANSAI) and the Asian Organisation of Supreme Audit Institutions (ASOSAI). Concluding the talks, the two auditor leaders signed a minute of their talks to lay groundwork for bilateral partnership in the future. On the occasion, Phoc presented 20 laptops as SAV’s gifts to the Lao staff.